'Seneca Feather Dancer' ( Dana Borglum, R. 1993) SIB, height 28" (71 cm), Midseason bloom. Standards feathery light blue, veined darker; style arms aqua; Falls light sky blue, dark veining at hafts; lightly ruffled. 'Gulls Way x 'Outer Loop'. 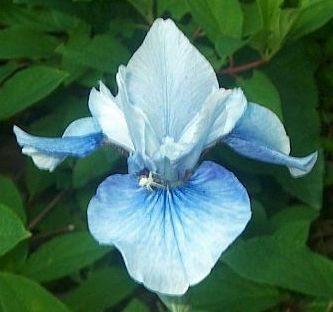 Borglum's Iris 1995.